In the past on this blog I have referred to a couple of images/anecdotes that look at the different behavioural attitudes we adopt in our relationships with people. What has been on my heart for a little while and what I thought I'd do in this post, is combine all three... and look at them together. "Accept that some days you are the pigeon and some days you are the statue". I know its a joke... but I have never felt comfortable with it. What it says to me is that when life drops a bucket load of guano on your head... its okay, because some day you'll be the one depositing the guano on somebody else. The second is the infamous story (once referenced in Star Trek: Voyager), of a scorpion who wanted to cross a swollen river. Aware of his shortcomings and knowing that any attempt at swimming would result in certain death, the scorpion attempts to coerce a nearby fox. The fox being cunning and wise points out that its a stupid thing to do because the scorpion will sting him and kill him. The scorpion reasons with him and points out that if he does sting the fox, they will BOTH drown in the river and die... so it isn't in his interests to betray his unlikely ally. The fox can't fault the scorpions logic and allows the arachnid to hop on his back. The couple begin their crossing and all is going well. However, when the fox reaches the deepest part of the river... the scorpion rears up his sting and plunges it into the neck of the fox. As the neurotoxin begins to take effect and the creatures begin to sink below the waterline, the fox gives one last look over his shoulder, stares forlornly at the scorpion and asks "Why? Why did you do this? Now we'll both die!" The scorpion answers "I'm sorry... I couldn't help it. It's just my nature." That story is a constant reminder to me that we all carry an element of the fallen nature inside of us... that even when our intentions are good and honourable, some times we fall prey to the remnants of the sinful nature that lurk deep inside waiting for moments to strike... just like a scorpion's sting. 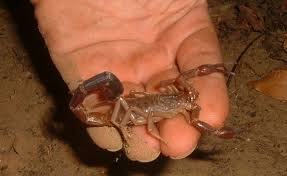 The last anecdote also contains an equally aquatically challenged scorpion who is in dire peril. This scorpion keeps slipping off a riverbank and falling into a river to his doom. Fortunately for him, two monks are washing bowls in the river nearby. One of the monks spots the scorpion and rescues him. In return for the monk's kindness, the scorpion... yep you guessed it... stings him before scuttling off. However, the scorpion is soon in trouble again and falls straight back into the water. The monk wastes no time in rescuing the scorpion again... and again. Each time he does so, he receives a sting for his trouble. This goes on until the monk's companion asks him "Why do you keep doing that? Don't you know that scorpion will just keep stinging you? That's its nature!" "Ah..." replies the other monk "... but it is my nature to save." Looking at those stories together tells us something quite profound about life. There are going to be times in all our lives when we mess up and hurt the ones around us - the ones who we care about... and who care about us. We can't help it... its in our nature (albeit a nature we need to resist). However if we strive with all our heart to adopt Christ's nature... the one that His Spirit calls us to, we can bear with one another's brokenness and faults with mercy and compassion... encouraging those around us to do likewise by the righteous examples God works through us. Sometimes we sting, sometimes we save... how we feel about those two facts reveals a lot about our character and our relationships with one another and God. What it is NEVER okay to do is to be the pigeon. Everyone knows what it feels like to be the statue... everybody knows how bad it feels when someone bombs your life with emotional excrement. We all know what it feels like to be stung... so can we really afford to take a blasé attitude with others, every time we feel an irresistible urge to unfairly offload our rubbish attitudes on those around us? Sometimes we sting. When this happens (as it does), we need to recognise we are doing it, what is driving it and ask forgiveness in all sincerity for it. Sometimes we save. We need to be watchful for those around us who are openly hurting. We need to go the distance and do what we can to help them out, even if it is just praying for them. They may sting you for your trouble, but never forget their value... or the fact that someday you may need a friend to save you in spite of your own stinging.